I'm having issues, is anyone else? I found posts from 5 months and 3 months ago that said there were issues with Engage slides that were imported into Storyline 360 and being published to REVIEW. I hope this is a setting issue, I'm new to using Engage 360 for anything. 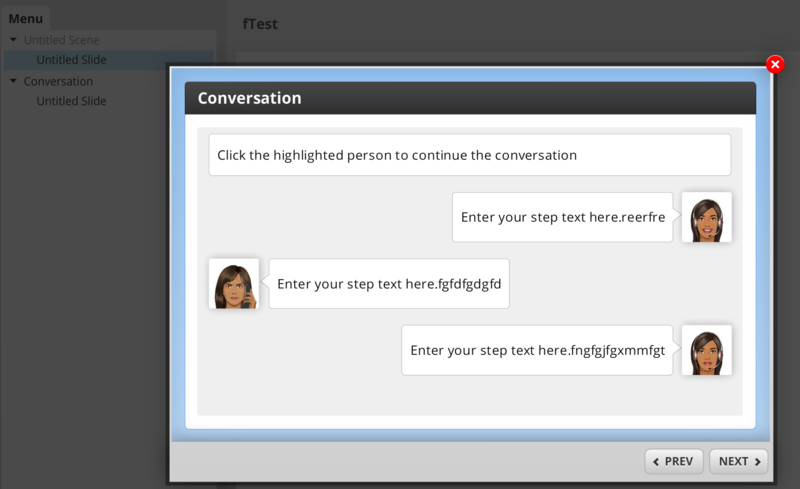 I'm using the conversation interaction and it has one bug I'm pretty sure is not supposed to happen, and another that seems like it would behave differently. These posts said that those issues were fixed with update 3 for storyline, and I have every app on the latest versions. I am seeing the issues when using the LightBox and on a regular slide. 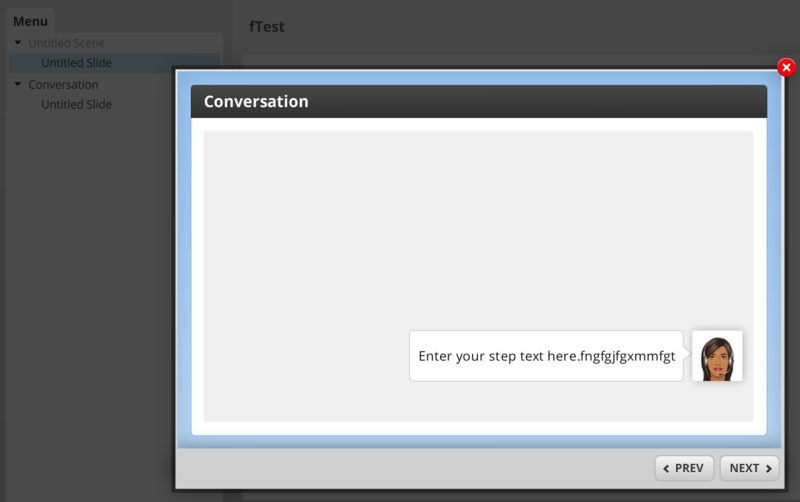 When I return to the lightbox after the first time going through the conversation it will only show the very last talk bubble and avatar, the other conversations are gone and the top text area is gone too. This does not always happen on the first time I revisit the conversations, but it happen after 1 or more times. I have this issue when setting the slide to reset to initial state. When the lightbox opens, the next and prev buttons won't do anything, but not disabled, and when I click the stage, it will reload the slide and start working. Is this how it is supposed to behave on the start of the engage interactions. Thanks for anyone letting me know if this my fault or actually a bug. Is it just review? I can't get past the beta review from Stakeholders since we have created a process for several projects already. I'm okay with creating the same conversation interaction from scratch if this can't be fixed. This shows what it will look like the first time, after I have to click the stage to reload the interaction which will then let the next and prev. buttons work. Hey Kyle - I did a brief test and I'm not seeing that behavior when re-visiting my lightbox slide. Would you be able to share your .story file for us to take a peek? Your example worked perfectly! Nice to see. Something must be wrong with my setup. This is nice to know, because I was creating one from scratch which is kinda hard with the need for the scroll bar. I'm attaching my .story file now. I just published "Web" and viewed in the Chrome Browser. It's doing the same thing, so I'm convinced I have done something wrong. It also has a new issue. I tried making a change and then publish to Review and after 10 minutes it says that it is still processing. Older versions are showing up. I published as a new version and then tried publishing as a new course. Leslie, could you do me a favor and send me the test file you made? This is not working for me after I tried new files - it does the same thing. It happens in the lightbox, and it happens if I visit the single slide. If I've viewed the lightbox and closed it, then both will show the last item, and when I use the PREV button, it will go backwards and only show one at a time instead of having all of the conversations and going backwards eliminating just 1 while others stay on screen. This engage file is previewing fine in the ENGAGE software, so I thought this was going to work and I only wasted 2 hours with it, so I may need to return to the custom version if this is an issue that can't be fixed. I'm very confused how it could work for you and not me. Yes, I can share what I worked on. I have not gotten back to testing your file. I think I'll open a support ticket. My team already started producing scenarios with the Engage Interaction, so I hope they can figure it out, if you see the issues with my file too and without answers. Do you have a case number for your Support instance? I just wanted to connect it to the work you've done here too so that our team isn't starting from scratch with you! Hey Kyle - In addition, I took a look at the file you've shared here and it looks to be set up in a more non-traditional way with the 'click' to see conversation. If you could share the .intr file with our team as well, that would certainly be helpful. I was wanting the lightbox with the interaction to appear after the user clicked something on the stage. I know your brief example used the next button from the interface instead of clicking on something on the stage. Is the next button the only traditional way of doing it or are there other ways to trigger the lightbox that might be okay, like using the timeline reaches cue points or timeline ends/starts? I will attach the Engage file here too. I didn't end up logging a support ticket yet. My co-worker told me that I wouldn't really need the Engage files once they are in Storyline. He said that in the past he has duplicated slides in Storyline that have an ENGAGE interaction (not the conversation interaction) and he had 5 slides that all had different content from him using the Edit With Engage in the Storyline Format tab. (Then Save and Close). Should we keep an engage file for each of 5 similar interactions that have different content? This is not what I did, but I don't want that to cause issues like what I'm having (later on in our project), but it seemed to publish fine for him. Hey Kyle - Using an object should be fine. I adjusted my file to include this as well. Your co-worker is correct, Storyline can do much of what is within Engage as well. It's your choice in how you'd want to build it though. If you find the Engage templates easier, that's perfectly fine. I am still not sure why your file displayed the behavior that it did. I adjusted my file and added your Engage file shared here and it works perfectly. File attached and here is the published output. That must prove that it's an issue with that Storyline file. But the bug has infested into are production files due tomorrow . I got a grace period till Monday though, so I'll have to revert to a custom version I created and shared with This Hero community. The NEW issue is is worse!!! It's happening with a production ready course that has 5 engage interactions . my co-worker and I took a finished Storyboard that was completed in Storyline and split it up to have me work on the first half while he took the second half. i was first having the issues in my testing file that I sent you, and my half has 1 of those engage interactions with issues you've already seen. now we published his half with 3 engage interactions and his is behaving worse. its set to automatically play (appears in a light box from clicking a true built in button this time. When we see it, the screen is empty (white stage / no graphics.) with the previous next button showing. We click next and nothing happened, then I rolled over the stage area and the white went away, but it revealed the 2nd speech bubble, not the first. I hit previous and it showed just the first speech bubble. I moved the mouse around and the white came back (turns out that the correct graphics only show while rolled over the stage with mouse and if mouse is off stage it goes back to all white.) it toggles back and forth. so his user experience is fully broken, mine kinda worked but is always broken when returning to review. this is happening with the regular slide too. Not just when lightboxed. I'm surprised no one else has reported this issue. im not upset, I understand that all software will have bugs. When you and your colleague are splitting up and sharing the file to work on it, are you following the steps here for collaborative workflows? That could be a root cause if the files aren't being saved and edited locally and contributing to overall oddities in the files. Just one idea as you dig a bit deeper into this issue! I'm glad the new ones worked and sorry that you'll have to work through the weekend on these. Keep us posted if you're able to figure out anything else that could have caused it! That is all great advice, but the file I attached was actually a testing file that was never part of a project. I wanted to make sure the whole set-up would work before having our team put this into our project files. Somehow the issue happened again in our project files that were never part of our test files, but they ended up having the way worse issue of showing only white on the stage until the mouse hovered over the stage. So 2 separate Storyline files are having the issues. I can't share the project with the same and additional issues but I'm stumped. Tom Kuhlmann actually shared an example of a custom solution that was better than my custom solution. It's more time, but pretty cool. Worth a try! But glad you got a cool solution from Tom too. It's so Odd, I'm back to the issues with a single Engage file from a brand new test file with just one button on a slide and then the other slide holds the engage file and opens on the first slide in a light box. We still want this solution, its quicker and easier for our IDs that have the TEAM 360 and could just send me (the developer) a finished Engage file, it was quick to teach them. I just edited my past and added the attachment of the 2 slide Storyline file.